Cut each piece of paper to 9"x9". Fold the white square in half and starting at the folded side, cut slits one-inch apart reaching almost to the end of the paper. Do not cut through the end of the paper. Open the folded paper. Cut the black paper into one-inch wide strips (note, there will be one extra you will not use). Weave the black strips into the white paper in an over/under pattern. After weaving in the seventh strip, careful cut the slits of the white paper through the end to open them up. This will allow you to weave in your last black strip. Cover all the edges with clear tape. Use buttons for checkers (red = Superman, blue = Batman). 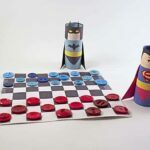 This project for Paper Weaving: Batman vs Superman Checkers was printed from CraftsbyAmanda.com - https://craftsbyamanda.com/paper-weaving-batman-superman/ and can only be printed for education or personal use.